The society has about 100 members drawn from all over the country. 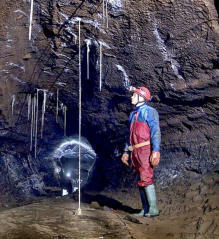 We welcome new members aged 18 and above with any level of caving experience. They are invited to join on a provisional basis for six months while becoming known and may then seek election to full membership. Full members living at the same address can then become joint members of the club to receive only one copy of club publications. Associate membership is also available to those wanting club publications but no other facilities. 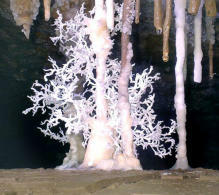 Two weeks temporary membership is available once only to inquirers and to our guests so as to provide BCA insurance if they want to try out caving in the company of experienced members. Provisional membership for new members wanting to try out our club costs £10 and is available once only for six months starting on any date you choose. It can, however, be extended by the committee beyond six months in some circumstances. 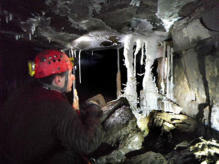 You must also get British Caving Association (BCA) active caver insurance one way or another - via our club, via some other club of which you are already a member, or from the BCA directly. If you have obtained your BCA insurance from elsewhere then you must give our club treasurer your BCA number and the name of the organisation providing it to you. All other types of club members pay an annual subscription which runs from October 1st each year. Full member £30. Joint members £40. Associate £18. Obligatory BCA insurance is additional to this. BCA insurance runs each year from January 1st and costs are pro rata the number of calendar quarters remaining rounded up. If you join in March therefore you will pay for 4 quarters but if you join in April you will pay for 3 quarters. Yes, it is messy but that is the way it is. The 2017-18 rate is £6 for non-cavers and associate members, or £17 for active cavers, that is everyone else who intends to venture underground. BCA insurance premiums are normally paid for the entire calendar year (from 1st Jan to 31st Dec) and the treasurer needs your payment well up front to enable us to put your next BCA insurance into place before your current insurance expires on the 31st December each year.